Few things take more than a decade to get done, and even then that's no guarantee they'll be done. Consider the failed Columbia River Crossing, 14 years and $170 million in the planning without a shovel of dirt turned. Portland's current work-in-progress, provisionally assigned a 2017 start date, is the cleanup of Portland Harbor under the supervision of the U.S. Environmental Protection Agency. Since 2000, when federal officials designated a nearly 11-mile segment of the Willamette River as a Superfund site, harbor industries and EPA have been working to define the scale of the more than a century's worth of pollution and to find a way to get rid of it without going broke. The last part is important. There are no funds in Superfund, a misnomer since 1990, when a federal tax that helped to subsidize cleanups went away. Now only those industries working in the harbor area -- the hub of industrial and marine commerce that makes Portland a working port city -- as well as their on-site predecessors will pick up the tab. Estimates of cleanup costs are breathtaking: from $200 million to $1.7 billion over many years. Unlike the CRC -- a maybe-we-will, maybe-we-won't undertaking by two states -- a Superfund site is a law-driven crackdown by the feds. In Portland's case, this megaproject will, indeed, get done, likely over another decade or more, and Portland businesses as well as some utility ratepayers will, indeed, pay up. Complicating things will be the thorny deed of deciding who among more than 140 potentially responsible parties pays what. If Superfund sounds like an economic meteor headed straight for Portland, it is: Unknown impact will be felt in unknown ways. It is therefore essential now, as Portland's Superfund cleanup starts to take shape, that city and state leaders publicly step up to help ensure damage is contained and that the environmental and economic outcomes fruitful. Leadership from Portland Commissioner Nick Fish and directly from Gov. John Kitzhaber shouldn't be a reach, either: Both the city or the state have dogs in the fight, as each helped pollute the harbor and will be asked to shoulder some cleanup costs. Rep. Earl Blumenauer, to his credit, has worked in recent years to keep the subject out front. EPA suffers the rap in many quarters that it is a lumbering bureaucracy blind to the economic consequences of its decrees. In Portland's case, however, the agency seeks a not unreasonable and measurable outcome: to restore the Willamette to a condition in which resident fish, among them catfish and bass, can be safely eaten by people; that's impossible now, as river sediments in the harbor are in places sullied by PCBs, dioxin, pesticides and polynuclear aromatic hydrocarbons. But Portland's and Oregon's outcome must be that in undertaking a cleanup, harbor industries are not hobbled by costs. The harbor's industrial and shipping activity mean that much to the broader economy of the city and the state. Proof it can be done is seen in Tacoma's Commencement Bay, a successful Superfund site with many responsible parties paying and Tacoma's economy thriving. As planning for Portland Harbor's cleanup enters a critical phase of an EPA-established timeline, Portland's riverfront industries should be more deeply engaged by the city and the state to help make explicit their need for certainty -- the faith they can invest and expand without drowning in costs. EPA can listen in, even if the political and economic factors of its work are not within its wheelhouse. Without reasonable certainty ahead, no industry -- whether here or in Cleveland or in Long Beach, Calif. -- can rationally invest or even plan to stick around. Already the harbor, beset by so many unknowns, poses upfront risk to industries that could be interested in situating here. 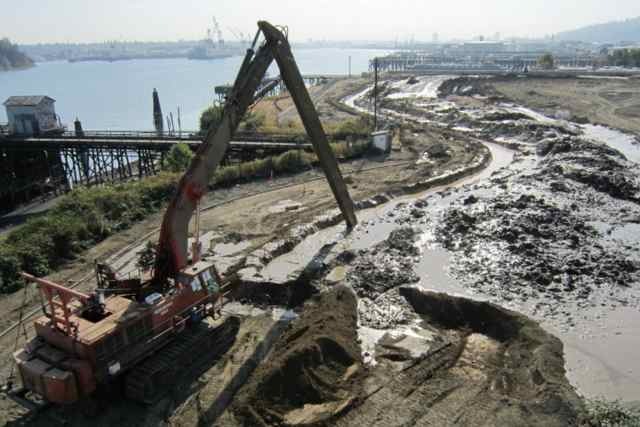 A subset of Portland Harbor industries, joined by the city, has been working with EPA to plow through highly technical sediment findings in an effort to establish the scale of the cleanup. The Lower Willamette Group estimates it has over the last 14 years spent tens of millions of dollars in providing studies and assessments that serve as the foundation of a cleanup plan -- only to have the EPA two years ago judge the group's work wholly insufficient to get the job done. EPA, meanwhile, is scheduled to come out next year with a cleanup plan on which the public may comment. Portland Mayor Charlie Hales should assist Fish, who oversees the city's Bureau of Environmental Services, and Kitzhaber as cleanup responsibilities are assigned. Portland's fortunes depend on it. Determining who pays what may be as important as the scale of the cleanup itself, as some former and polluting harbor tenants -- the United States, for one, for its wartime shipbuilding practices -- still have deep pockets. Portland's cleanup needs to achieve the right environmental and economic goals without ending up in a thicket of lawsuits. Each goal needs to be rational and doable; each can be the other's complement. Oregon has forged rational and doable approaches when it comes to salmon protection and the allocation of scarce water in the Klamath Basin. It can help find one for Portland Harbor, too.